Backyard Cleanup Tips - Hometown Waste and Recycling Inc. If left untended for a certain period of time, a backyard can overgrow and spiral out of control. In fact, a backyard can spiral so far out of control that it feels overwhelming. To help you get back to a manageable starting point, here are some helpful backyard cleanup tips. You can’t do anything until you get rid of any trash or debris that’s lying around. So put on some gloves and get started with picking up and trashing any large or foreign items that have no place in a beautiful backyard. Depending on this size of the yard, this shouldn’t take too long. And it will give you the space you need to focus on cutting back and managing your grass and other greenery. If a backyard is in bad shape, the grass is probably growing above the knees. You can’t just start up the mower and begin attacking it. First, get a weedeater or similar tool and hack any knee-high grass down to just a few inches. Depending on how high the grass was to start with, you may need to do some raking and bagging to get the clippings out of the way. Once you’ve hacked, you’ll be ready to trim with a mower. Once the weeds and tall grass are gone, you’ll want to mow at a proper height. If you cut too low, you’ll scalp your grass, weaken it and leave room for weeds to sneak in. At first, try mowing at the mower’s highest height. This will still give you a nice and level surface. Also, consider fertilizing with a product that also eliminates weeds. This will help strengthen and thicken your grass for the future. Once you’re done with the grass, head to the flowerbeds, where you’ll need to remove any existing weeds. Make sure you grab by the roots, or else the weeds will just grow back in the same places where they were pulled. After the weeds are gone, rake your beds and prepare to plant something wonderful. During the course of your cleanup, you may find steppingstones, paths or walkways that had been long forgotten. Make sure they’re completely clear and trimmed. This will immensely help the appearance of the yard. Now that you have a blank slate on which to work, create a master plan for the future. What types of things do you want to grow? How should you take care of the yard? It’s also important to create a calendar for maintenance and planting. A calendar with reminders will help you put your backyard on cruise control so you avoid any major cleanup efforts in the future. 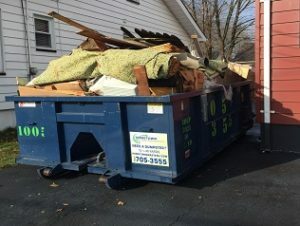 Take advantage of these yard cleanup tips and get in touch with Hometown Waste & Recycling Services, Inc. if you need a dumpster rental for your backyard cleanup efforts. We are New Jersey’s source for quality, affordable dumpster rentals of various sizes.